No one would dare question the belief that industry has a way of making messes and leaving them for others to clean up… or just leaving them and hoping no one ever realizes a mess got made in the first place. Some folks in a New Jersey community believe they have caught a company red-handed at a closed quarry and have asked the State to step in. Residents and public officials in Basking Ridge, NJ asked the Department of Environmental Protection (DEP) to put pressure on the operators of the closed Millington Quarry on Stonehouse Road because they had evidence which suggested contaminated soil may have gotten trucked into the site over a period of years and used as back fill material. The DEP issued a letter to Millington Quarry, Inc. and Tilcon New York, Inc. recently stating that it requires additional soil and groundwater testing around the property of the now closed quarry… and they want the testing done in accordance with State approved testing methodologies before the cold weather begins. Needless to say the DEP’s position pleased the residents and officials in Basking Ridge, NJ. The Department of Environmental Protection (DEP) has called for additional soil and groundwater testing at the closed Millington Quarry on Stonehouse Road, to the approval of township officials. Millington Quarry, Inc. and Tilcon New York, Inc., the company that had been quarrying the site before operations ceased last May, were this month informed that the DEP wants further testing at three areas of the quarry where water and soil samples showed a limited presence of contaminants. A letter to the quarry on Oct. 16 called for the quarry to follow the state’s methodology in conducting the additional testing before the onset of cold weather. The township has been embroiled in a legal dispute with the quarry based on suspicions of contaminated soil being trucked into the property over a period of several years. The soil was used to fill in steeply quarried areas. Random testing of some of those truckloads by a township consultant identified the presence of some contaminants, according to township officials. David Oster, a section chief with the DEP’s office of Brownfields Remediation & Reuse, wrote in his Oct. 4 letter that the quarry’s limited groundwater investigation into wells on the site had shown elevated levels of arsenic, lead and other volatile chemicals in one well, and arsenic exceeding the DEP’s standards in another. Stories like that make us wonder how many companies have knowingly dumped loads of fill material they knew contained higher than expected and/or allowed levels of contaminants in places — and gotten away with it. On second thought, maybe we don’t really want the answer to that question. It might scare us a lot more than we’d like! Spot testing pays off in the end? Of course it does and this story proves it! Without the township hiring a consultant to perform sampling and testing on the loads of material entering the quarry the town would never have gotten the data it used to persuade the DEP to intervene. Remember: The article said “elevated levels of arsenic, lead and other volatile chemicals in one well, and arsenic exceeding the DEP’s standards in another” which means those potentially hazardous items could have seeped into the local groundwater supply undetected and then found their way into the local population’s drinking water if someone had not stepped up done a little bit of testing. No one will step and test YOUR water for you, though, if you own a private well… and that means whatever contaminants your well pumps up become your responsibility to detect, report and ultimately get rid of. 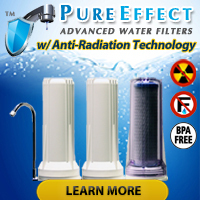 No matter how you look at it, and regardless of whether you have well water or city water, responsibility for the quality of the water coming out of your faucet rests solely on your shoulders… and if you choose not to test, then you have chosen to blindly accept any contaminants that may or may not have entered your water supply. 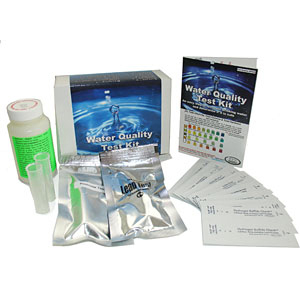 Kits like the one on the left will do nothing to help you — and neither will anyone else for that matter — if you don’t keep tabs on the quality of your own water supply! 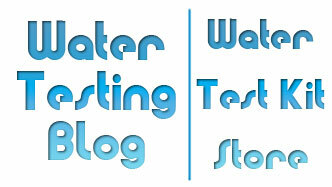 Want to test for a few more important water quality parameters? 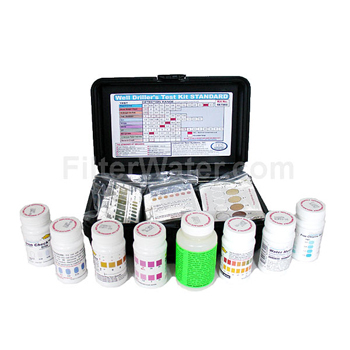 If so, then upgrade to the Well Driller Master Test Kit and add 10 Arsenic Tests, 50 Copper Tests, 2 Lead in Water Tests, and 2 Pesticide Tests!